Say Good-Bye to Being Disconnected. I travel a lot and I use my phone and tablet for almost everything. Whether it’s finding that perfect restaurant or GPS to get me there. Not to mention, being a mom and a business owner, I simply can’t afford to not be connected and risk missing a phone call, text or email. Sure, having a charger in my car or a charger for an outlet is great to have but, what happens when you aren’t in your car or near an outlet? When I was asked to review a Moonstone, I was more than happy to give it a try. What appealed to me was the design, it’s sleek and attractive. It is a gorgeous little piece of technology that fits in my purse and that will always help me stay connected with the world. They come in Glossy Black, Pearl White, Rose Red, Sunfire Yellow, Carnation Pink, Sky Blue, Apple Green and Sunkissed Orange. 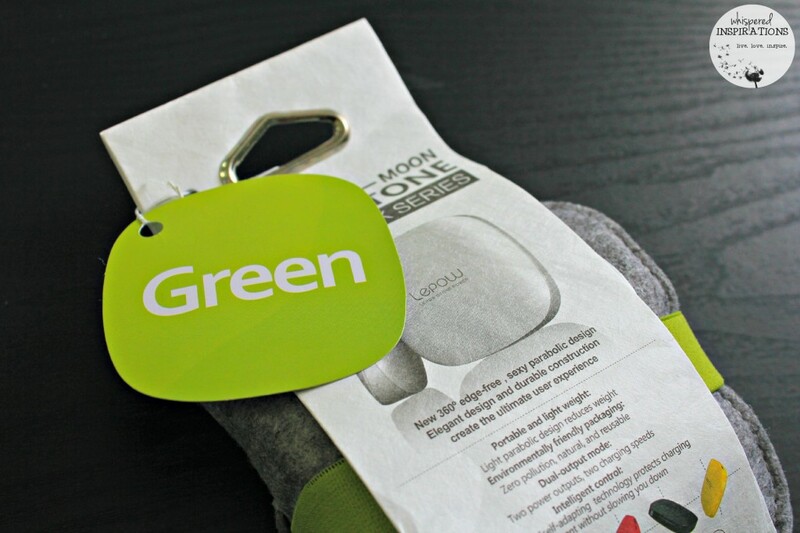 I received the Apple Green, I loved how it came in green, reusable packaging (wool packaging made from recycled materials) and without even opening it, I could tell that it was very lightweight. One of the things that I am most impressed is the size. It’s design was inspired by nature and derived by cobblestones that perfectly reflected nature’s incomparable mystery and beauty. I’ll take that. What I love is that it isn’t clunky as other brands and this is something that is a bonus for my already over packed purse. Portable, shiny and pleasing to the eye. That alone had me very interested. With the press sample that I received, I was sent some extra goodies. I’m not sure if they would be in your package if you were to order one. But, it came with a Micro SD USB, cable wrap, mini stylus, button stickers, a 24 karat plated label/sticker, a sticky pad to attach to your Moonstone and to any surface and a fun and decorative dust plug. 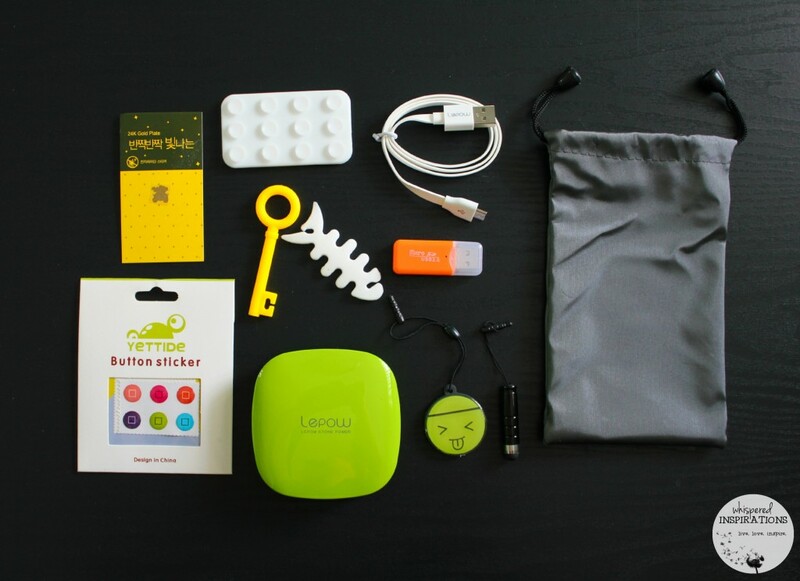 The charging cable is included and a bag to store it all in. 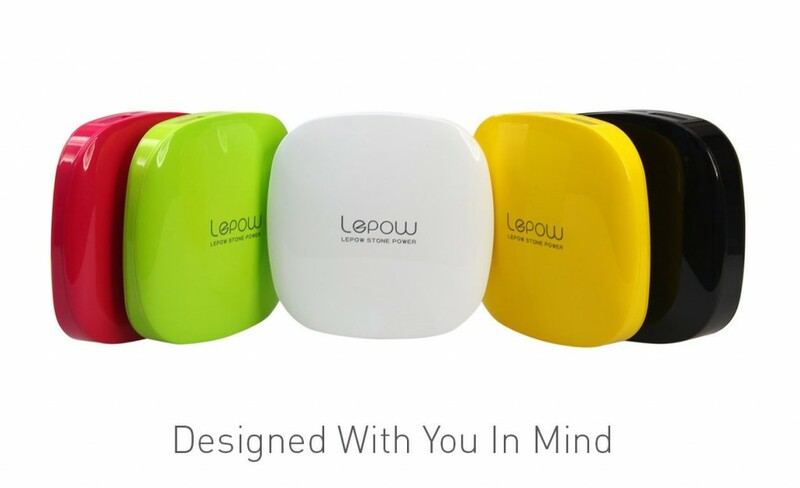 The Lepow Moonstone has 3 ports, the first is to charge your smartphone up to 3 times, the second is to charge your tablet at double the charging speed and the third is to charge the Moonstone itself. You will also see a button, when you press this button, you will see bars illuminate the Moonstone and show you how much charge you have. 4 bars are a full charge. I was very impressed with this feature since chargers that I’ve used before, you didn’t know how much charge you actually had and were unreliable. 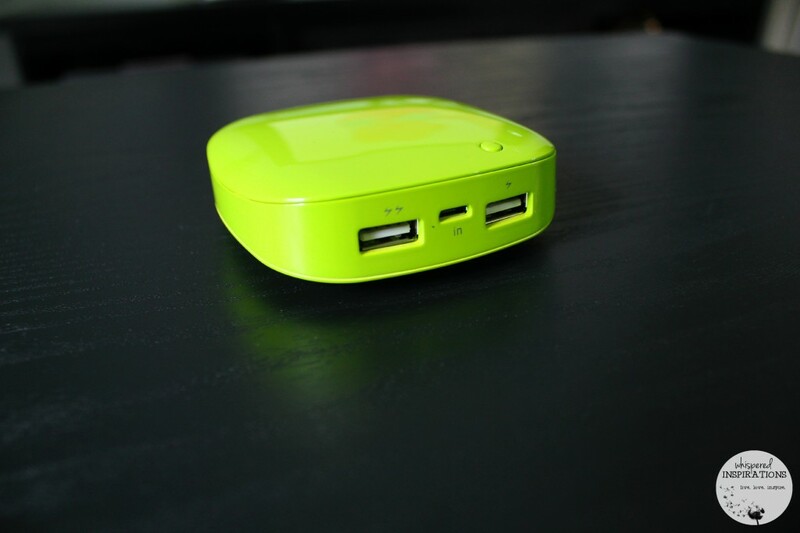 It’s smart too, when you unplug your device, it will shutdown automatically and save the remaining power. When it is in sleep-mode, it can last up to 6 months. It’s also compatible with any device and that is amazing. Not to mention, you can charge two devices at once. I have used it and with one full charge, I have charged my devices at least 3 times and I still have 3 bars. What’s even better is that I’ve done this while I am running around doing errands and they are charging in my purse as I am on the go. I’ve tried other chargers and while the clunkiness was livable, the charge wasn’t acceptable. I’m super happy with the Lepow Moonstone and so far, so good! Charging the Moonstone takes longer than it takes to charge your devices, this is understandable considering the power it holds and how often you can fully charge your devices at a time. But, now, I never leave home without it in my purse. It is a lifesaver! You can buy yours, here. 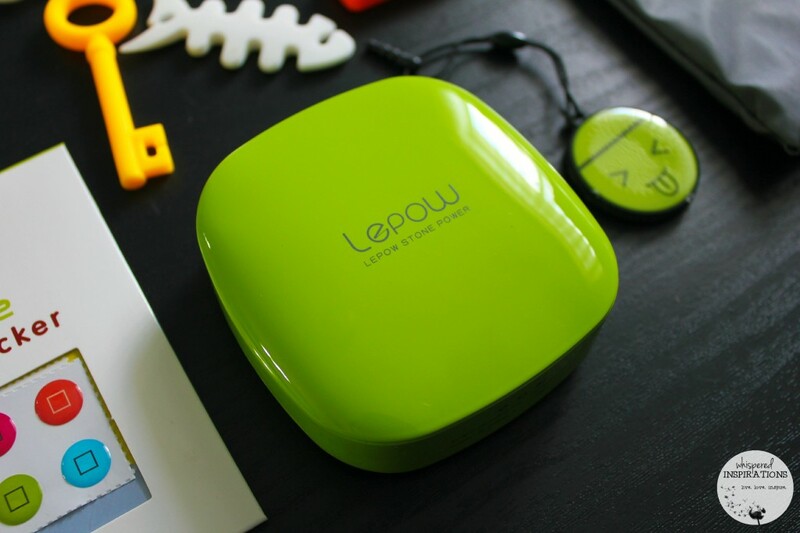 I recommend the Lepow Moonstone for those who love their music, business people and bloggers, travelers and anyone who doesn’t like to be disconnected. So, that’s umm, EVERYONE. One lucky Whispered Inspirations reader will WIN their very own Lepow Moonstone charger. This contest opens on February 27th, 2014 and ends March 14th, 2014. Contest is only open to US/CAN. Happy Entering! 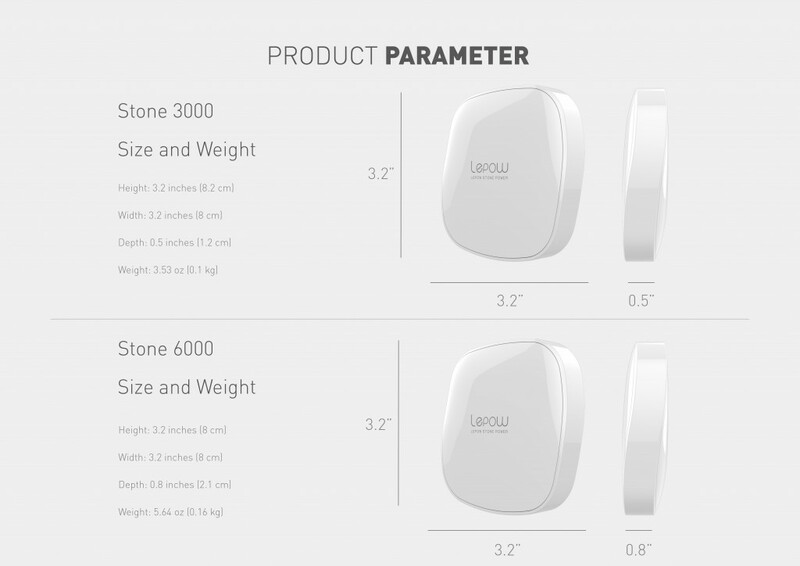 You can get more information by visit Lepow Moonstone and by liking them on FB, here. 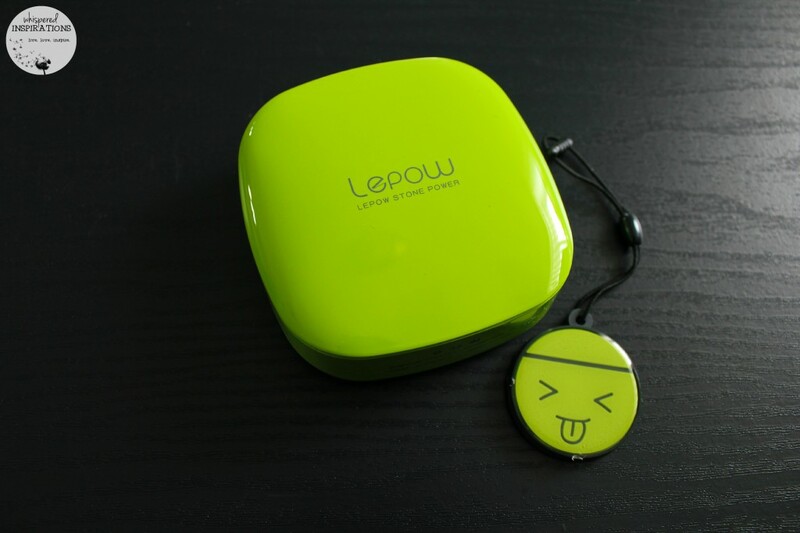 You can also follow @LEPOWOFFICIAL for their latest updates and news. Have you ever been left without a charge, what did you do? If I happened to win this I would pick yellow, it's bright enough that I wouldn't lose it..lol it sure stands out!! This so fabulous!! I love the design, the colours, the size so it can fit in your purse. Although I don't see it shown, if the orange is available, I would definitely pick that. If not, than the green. My laptop only has enough power to last 2 hours (ggrrr) when it is not plugged in to a source – so something like this would be amazing to have. I would pick the red if I won! Sounds like a great product! I would choose bright red. My favourite colour is the Apple Green. I'd choose white if I won! The whole family love your community blog,keep us updated to newest tech,travels,hotels,restaurants in other words we can say everything you post are so helpful.Thanks for gives a chance to try those products.We enjoy your blogging ads so much….Is The Best,Successful and the Cheapest way to advertise.We loveYou. From steady readers. I would want Sapphire Blue! I would pick white! Awesome giveaway! This looks so useful, simple and compact. Thanks for introducing me to this item and offering a great giveaway. The Sapphire Blue is really nice! Any color would be great! Easy choice for me- I'd go with the Apple Green. It's bright enough that i'll be able to find it at a glance. where is your G+ button to share? It should be in a floating display to the left of the post. Do you see it? Hmm, I think my sharing button is acting up. Let me look into it and see what I can do. I like the red buy any colour would do. My recent post Do You Have Work Discount Perks? I love the glossy black! I like the black or the red. I would love a sapphire blue moonstone! the yellow one, it's so bright and happy looking! I would pick the Sunflower yellow! Such a great idea. I love the Apple Green color! love the blue one thanks! I would choose a red one, it would be easy to find. I like the sunfire yellow. Easy to find in my purse!